Flip Flips are just a part of summer like lemonade and pools. 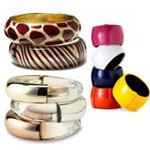 Everyone wears them – they are easy, comfortable and bool/peach ready at all times. 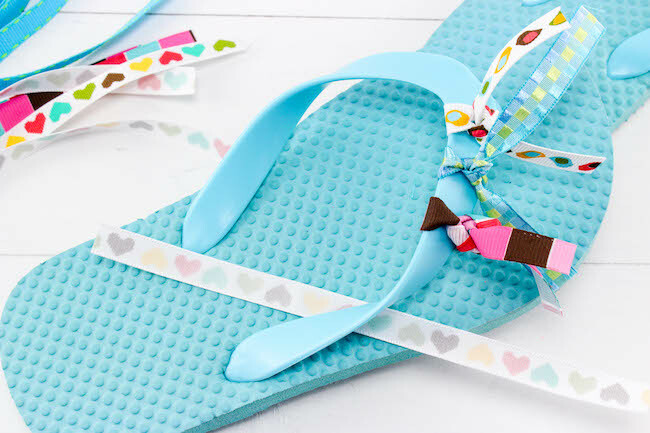 But how about kicking them up a notch with some fun DIY flip flop crafts that will let you make your simple flip flops something special. These DIY ideas are really great for girls parties too! 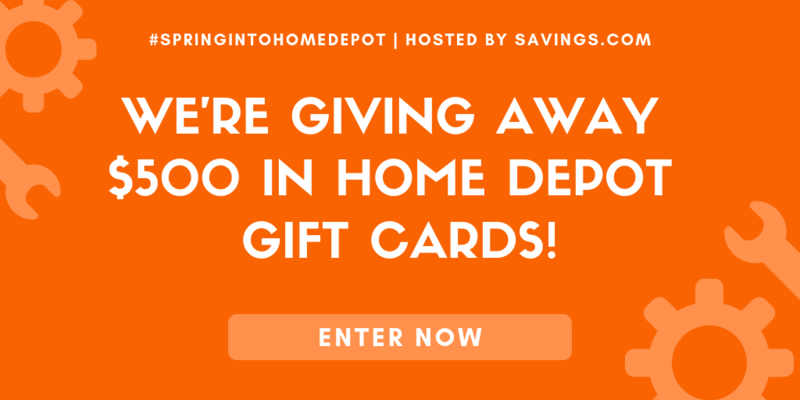 Just grab a variety of items to let them decorate their own – makes a creative party favor and a way to let the girls bond! 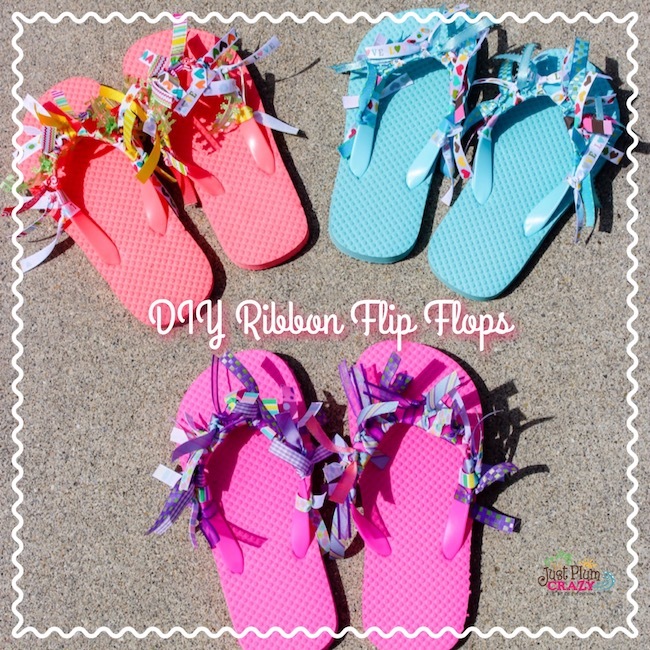 We have included a DIY Ribbon Flip Flop with instructions and some samples of what we made, but are also including a few other ideas we found online so you can be more inspired. 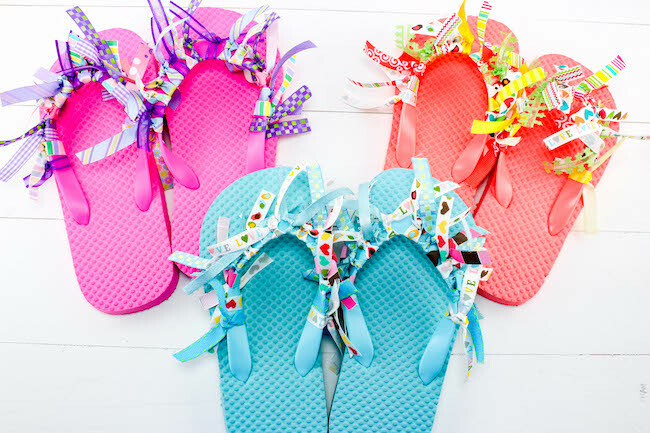 If you did not know, the 3rd Friday in June is National Flip Flops Day, so what better day to create your own ribbon flip flops to kick off the summer with. Add in some baking fun with our Patriotic Flip Flop Cookie recipe and you will have a fun filled day planned! 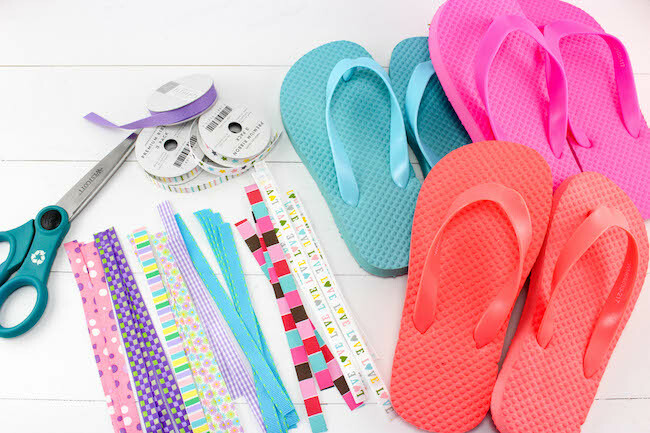 You can pick up flip flops at the Dollar Store for cheap as well as ribbon in their craft aisle. You can find the cheaper flip flops at stores like The Dollar Store, Dollar Days or Walmart. We found our ribbon at our local Walmart but we wanted a good a variety – the dollar store by us had ribbon but they were not bright and colorful – so we made a separate trip! 1. Cut pieces of ribbon about 6 inches long. You will need between 14-20 pieces depending on the size of flip flops. 2. Take a piece of ribbon and tie it around the band of the flip flop and make sure to knot it twice so it is secure. 3. Repeat step 2 until you have filled the flip flop bands as much as you like. 4. Great for parties or just a summertime craft!